We offer collection and delivery services to both our private and commercial customers within the greater Gauteng area and we have access to skilled resources throughout South Africa. We offer a one-stop IT solution which covers most IT-related services and, therefore, our clients will not end up with a situation where different suppliers are passing the buck. We take full ownership and manage the IT services for our clients and, in so doing, we reduce cost of ownership and we offer a single point of contact to our clients. Hardware and software maintenance services – Repairing equipment on-site ensuring minimum downtime. Maintaining equipment that is out of warranty and declared redundant by the OEM – Sourcing Cisco and 3COM spares and components where most suppliers fail. Comprehensive service level agreements – We offer fixed service levels from 2 hours MTTR (mean time to repair) to next business day, depending on the severity of the service disruption. We supply obligation free quotations for maintenance contracts and service levels. IT consulting and on-site resourcing – Placing skilled resources on-site to assist with IT related projects. Installations and Upgrades – We install new equipment for clients and assist with the setup and configuration. Ensuring high standards and optimum network performance. Networking design and expansion – We assist with network design and future network expansion planning. Our objective is to ensure that our clients save costs on network expansions and do not compromise on quality and network performance. Preventative maintenance – Service equipment on-site to reduce failure rates and increase equipment lifespan, ultimately reducing costs for our clients. 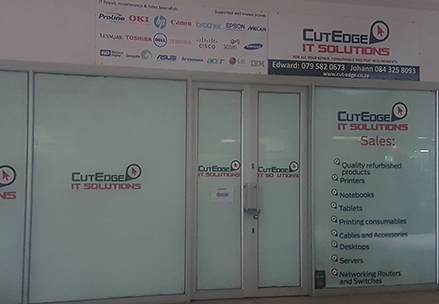 Cut-Edge IT Solutions is a LEVEL 4 BEE Contributor.